The more lean body mass you have, the higher your metabolism is likely to be. Having a healthy percentage of lean body mass may make you less likely to become sick or to develop health problems such as heart disease or diabetes. Having a low lean body mass, however, may increase the risk of side effects from medications. Figuring out your exact percentage of lean body mass isn't easy, as the more readily accessible methods for measuring body fat contain a certain amount of error. In general, men and younger people tend to have more lean body mass than women or older individuals. Typically, women have more body fat than men, even with the same body mass index. Women need to have more body fat than men so they can bear children, so they tend to average a less lean body mass than men. For example, a woman with between 25 and 31 percent body fat would be considered average, but for a man, the average amount of body fat is between 18 and 24 percent. This means that average lean body mass for a woman would be between 69 and 75 percent, and for a man, average lean body mass would be between 76 and 82 percent. Lean body mass usually ranges from 60 to 90 percent of body weight. A woman with a lean body mass percentage of less than 68 percent would be considered unhealthy, as would a man with less than 75 percent lean body mass. Athletes often have lean body mass percentages between 81 and 91 percent for women and 84 and 94 percent for men, which is considered normal for trained individuals, although it's lower than the average for healthy individuals. It isn't healthy, however, for a man to have less than 5 percent body fat or a woman to have less than 8 percent body fat. The average lean body mass for Americans fits within healthy ranges. In 2000, the average lean body mass for women was between 69 and 76 percent, and the average lean body mass for men was between 75 and 86 percent. These numbers vary by age, with the average lean body mass for people in their 20s at the higher end of these ranges, and the average for people in their 60s or older at the lower end of these ranges. Typically, older people have more body fat than younger people, even with the same BMI. As people age, they tend to lose lean body mass at an estimated rate of about 3 to 8 percent every 10 years after age 30, according to an article published in Current Opinions in Clinical Nutrition and Metabolic Care in 2010. Since it's also common for people to gain weight in the form of fat as they age and as their metabolism decreases, elderly people sometimes have low levels of lean body mass, even when their weight is at what would normally be considered a healthy weight. People often go on a weight-loss diet in an effort to lose body fat and improve their body composition. This can backfire, however, and lead to lean body mass loss, if you don't eat enough protein or get enough exercise while you're losing weight. A study published in the Journal of the American Dietetic Association in 2008, found that people who followed a weight-loss diet that was low in protein lost more lean body mass than those who ate more protein during their diet. In those individuals who don't participate in resistance training during a weight loss diet, about 25 percent of any weight they lose comes from lean body mass instead of fat. 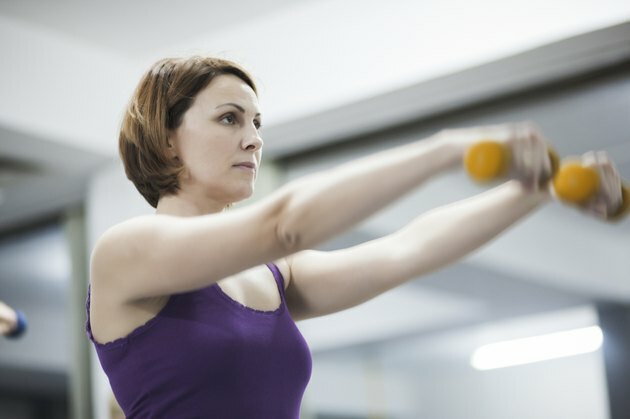 Try to complete at least two resistance training sessions a week to limit muscle loss and increase your metabolism, and do approximately 300 minutes of cardio per week to help increase weight loss results.